Opened in September 2015, Boston's Envoy Hotel is a new addition to the city's so-called 'innovation district.' The hotel is part of the Seaport Square development, encompassing 20 blocks of waterfront real estate. The Premier Suite has floor-to-ceiling windows with views of the waterfront and city skyline, plus an oversized couch, wet-bar and custom art and furnishings. Premier Suites at Boston's Envoy Hotel are complete with oversized 'gaming chairs' facing a wall-mounted flat screen and a well-appointed bedroom with sliding-door privacy. Suites are priced at $1,000 per night. There are 136 guestrooms in addition to the two Premier Suites. The hotel is pet friendly and offers free Wi-Fi. The two-piece bathroom features a textured, pebbled wall with sleek, modern furnishings and locally sourced bath products from Fresh. The Envoy Hotel is the first Boston property in the Autograph Collection by Marriott. Sliding doors with an antique map of Boston separate the bedroom from the full bathroom, which includes a luxurious rainfall shower and oversized robes. An exterior shot of the Envoy. The neighborhood is also home to District Hall, the world's first free-standing public innovation center; plus established sites like the Boston Children's Museum, Harpoon Brewery and Institute for Contemporary Art. The hotel has a fitness center with cardio and training equipment, including treadmills, total-body elliptical and cross-training machines, recumbent bikes and free weights. The lobby of the hotel. There's also a rooftop bar, Lookout, open from the beginning of June through the end of October. Pictured here is the hotel's restaurant, Outlook Kitchen and Bar, located just off the lobby. 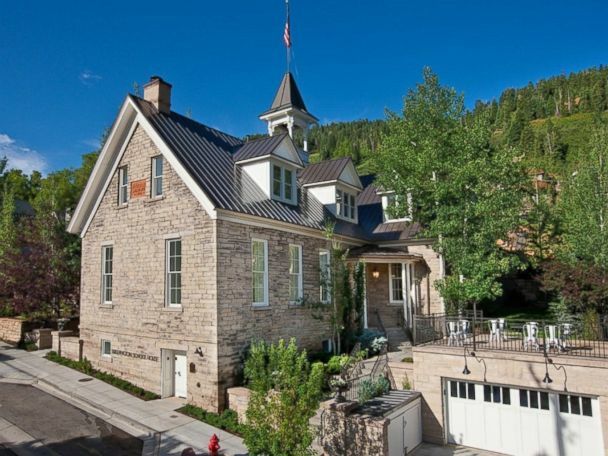 Housed in one of the nation's last remaining school houses, the recently refurbished hotel fanciest room starts at $2,000 per night.